There’s nothing like the feeling of falling in love and fallen I have. Wait – no news on the “guy” front – I’ve fallen for this Sweet Sorghum Vinaigrette. I think you’ll feel the same way once you taste it! A touch of sweet with just a hint of smoky warmth, this is unlike any dressing I’ve ever tasted (or made) before. Even though I call this Sweet Sorghum Vinaigrette, it isn’t overly sweet, but it just has the perfect hint of sweetness to offset the taste of just about any salad greens; especially any greens that have a hair of a bitter note, Spring Greens, arugula, or even sturdy greens like kale. It would be lovely drizzled over a crisp apple or pear salad or any Autumn type salad, maybe one with pecans and deep leafy greens. I imagine it would also be wonderful over a grilled or sautéed butternut or acorn squash. You’ll just have to taste it and see for yourself. A concentrated apple cider, sorghum and a wee hit of bourbon take this dressing absolutely to the next level. So does the creamy emulsion – do take a moment to pull out your blender for the best texture. I thought about adding a little cayenne to the dressing to add a touch of complexity; I wanted something that was going to bridge all those flavors but settled on a surprise ingredient – just the slightest hit of white pepper. It’s a magical alchemy of ingredients that make this an outstanding dressing. If you’re not familiar with Sorghum, you’re not alone. Sorghum is a grain, grown in a number of areas and is considered to be an important world food, according to Wikipedia. I know it from growing up in Iowa where it is a big crop in the southern area of the state. And I know it from Sorghum Syrup, which can often be found in the baking aisle, usually around the items like corn syrup and molasses. I also have a couple of other recipes on the site (I never like to leave you high and dry with an ingredient you’ll buy only for one recipe) that use Sorghum Syrup, and it can be used as a pancake/waffle syrup, too, so don’t be afraid to buy a jar. My favorite way to use my Sweet Sorghum Vinaigrette is as a part of my Taphouse Salad. I posted it earlier this week and it is a beauty. Just FYI, there are quite a few components to that Taphouse Salad, which is named after Taphouse 41, a restaurant in Sioux Falls where I discovered that marvelous salad. The Sweet Sorghum Vinaigrette is just one of those components. The Taphouse Salad also has beautiful greens, of course, and a Smashburger, Pan Roasted Mushrooms & Onions, Slow Roasted Tomatoes, apple, and goat cheese (or Brie) and is topped by this Sweet Sorghum Vinaigrette. It’s worth searching out the Sorghum. While there are so many dressings that can be emulsified by just shaking in a jar, this is one of the recipes I do like to take the extra step of pulling out the blender for. What you’ll get for that extra few minutes of work is a gorgeous dressing that looks like it came off the shelf, with none of the strange ingredients, preservatives, and emulsifiers. If you’re a label reader, you know what I mean and if your not, maybe it’s time to start. Salad dressings are one of the worst offenders. Sweet Sorghum Vinaigrette does hole the emulsion for a day or two, then will likely thin out a bit on its own. Then you can toss it in a jar and shake it up if you wish, before using. The Sorghum Syrup to make this dressing isn’t pricey, or at least shouldn’t be. It also has an incredibly long shelf life, and I’ve used it in other recipes on the site. If, after a long time (we’re usually talking a couple years) when held on the shelf, it starts to crystallize a bit (just like honey does) slightly heat it and stir it back together. Clean the jar well. And clean the lid of the jar well after using or you’ll have a had time opening it, later. If you cannot find sorghum (gosh I hate to say this) use a combo of a little molasses cut with corn syrup. Keep in mind that regular old corn syrup is NOT the same thing as high fructose corn syrup. So no angry emails, please! And while corn syrup can’t claim any health benefits it’s not quite the same demon that high fructose corn syrup is. If you don’t usually buy or drink apple cider (but you may wish to make my Warm Mulled Apple Cider) it’s probably not going to be worthwhile for you to buy it for just a cup. Use apple juice, instead. In a saucepan, reduce apple cider to about 1/4 cup. Set aside to cool while the rest of the ingredients are assembled. In a blender, add vinegar, bourbon, sorghum, Dijon, mustard powder, salt and white vinegar. Pulse to blend. Add in apple cider reduction. With blender running on low, remove the center of the lid. Very slowly, in a thin stream, pour in the oil. Continue to blend until an emulsion is reached. Note: No Sorghum? I hesitate to advise this but consider subbing in two or three tablespoons of molasses, then filling the rest of the measure (1/2 cup) with light corn syrup. I’ll be bringing Sweet Sorghum Vinaigrette and the rest of my Taphouse Salad over to Throwback Thursday, Quinn of Dad What’s 4 Dinner and Alli from Tornadough host this blogging extravaganza. I’ll also be bringing this outstanding dressing to Fiesta Friday 91, put on by Angie of the Novice Gardener. The hosts this week are hosts this week are Juju @ cookingwithauntjuju and Indira @ I’ll Cook, You Wash. This entry was posted in Click here for Fabulous Food Posts and tagged Salad, Salad Dressings, sorghum, Taphouse Salad, Throwback Thursday, Vinaigrette. Bookmark the permalink. Not sure I even know what sorghum is 🙂 Is it like maple syrup? I do have molasses, though. As to why I have it, I can’t remember. Since I don’t seem to ever use it 😀 I think my daughter was reading Little House in the Prairie and asked if she could try molasses. I think that was why I bought it. 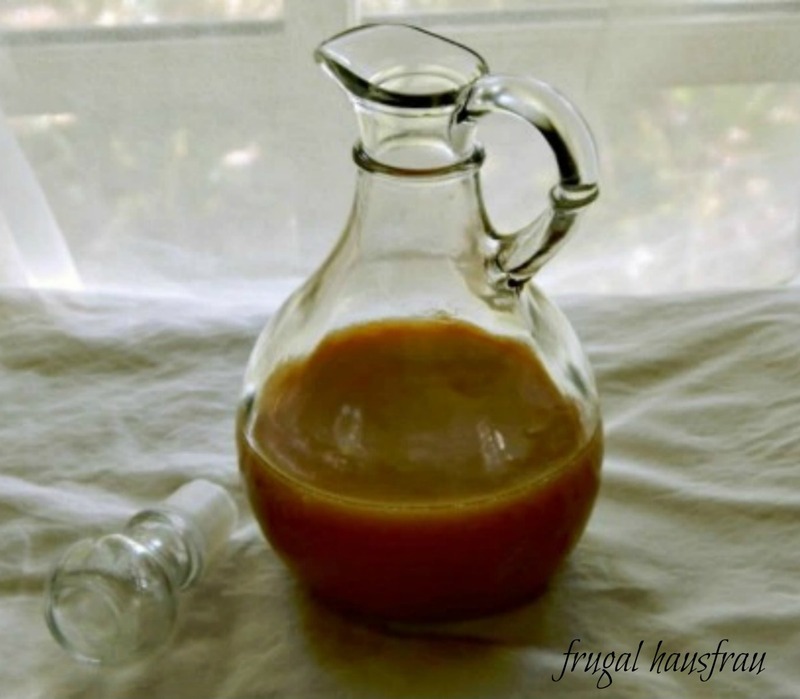 So nice to know I can make this delicious vinaigrette with it! It is kind of like a mild. sweet molasses. If you think of it as a sweetener with a bit of earthy bite, that’s sorghum. Like if white sugar was Budweiser, Brown Sugar might be Samuel Adams, Molasses would be a Dark, more bitter Beer – Sorghum is kind of like a Trappist Ale – somewhere between Brown Sugar and Molasses. One great thing – Molasses keeps ForeEver! I’ve used bottles literally years old – just make sure the cap goes on very clean or you’ll never get it off! My molasses is at least 5 yrs old. I tasted it and it didn’t seem to be off or anything. Amazing! Molasses cookies sound fabulous, thanks! The Spam experience, lol! It’s not for everyone, that’s for sure! Okay I need this salad. With my family being from Kentucky I am familiar with sorghum. This would be great on some grilled fruit or even as a glaze for pork. Quinn, you are such a genius! I was thinking this would be good on a fruit salad, but on grilled fruit – wow! I can imagine it drizzled over grilled pineapple and served with ice-cream for dessert! I love vinaigrettes that move beyond the standard flavours. I’ve never tried sorghum before actually so I definitely wont cause an uproar 🙂 . Happy FF! Ah, I love this dish! I love sorghum, although I’ve never made a dressing with it. I definitely thought you were going to go into a romantic relationship at the beginning of this blog post, but I’m glad you love this dressing so much! Yum! Happy FF! lol – I think I might be having a romantic relationship with this dressing! 🙂 🙂 Happy FF to you, too! I love this vinaigrette a lot – thanks for giving a sub for the sorghum – otherwise I have everything in my pantry, even some good bourbon! Believe it or not, I found it at Hy Vee in Sioux Falls and had to search all over for it in the Twin Cities. I always seem to have Bourbon, too, probably because I rarely drink it! I think it was bought for company. It’s nice to have a little excuse to pull it out and dust it off.